I feel sorry for people who tries to remove this minion thinking that the attacks of the buffed mechs will be reverted. It literally says Un'Goro hows it even a hint? A better mid to late drop than Enhance-o Mechano with more than 2 mechs on broad, and is easy to accomplish with mech oriented decks. Extremely powerful when paired with Time Rewinder. It is very good when you have a few mech but even with one mech it is worth to play it. Since the effect is permanent it is one of the strongest mech synergy cards. man, you really got some hate just for liking the animation lol. it's def not great but it's not that bad. it's got a nice voltron feel to it. May finally see play after the Undertaker nerf. well it might finally start seeing some play next month. mech hunter looks like it's shaping up to be pretty decent in wild anyway. This card has so much value. If there is a mech deck that's actually good (and I am not too convinced of that yet), then this card will automatically make that deck even better. It is such a powerful card. A permanent Savage Roar (for mechs) on a 3/3 body is crazy good. I am just not impressed with the mechs. I have so few cards on my account, and my simple level 10 basic card decks are doing quite well against the mech-only strategies, which does not bode well for them since I lose to everything else. Great animation on the golden. Would it be crazy to treat this minion like a Savage Roar? Of course it could only really work like that if you've abandoned beast hunter entirely. Nah, that's crazy talk, right? Realistically, this card is a solid early play, and it's a good card to draw late. You can either buff your minions on board for better trades or you burst the opponent down with your mechs. 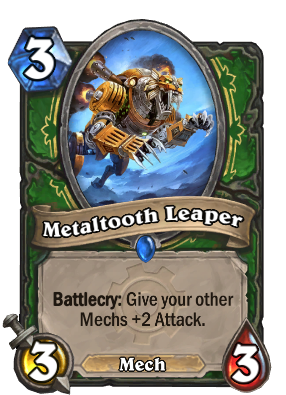 Metaltooth Leaper's effect is permanent. Based on one hunter card? Your stupid.. or ignorant or both.